The man at the center of it. Click here for more photos. ​Louis' only son to survive adulthood, he died in 1765, before his father, and therefore never succeeded to the throne of France. 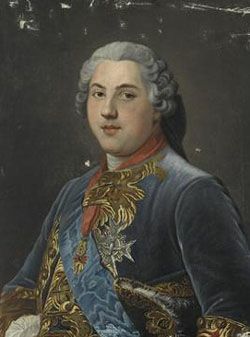 His son, Louis XV's grandson, was the ill-fated Louis XVI. ​Infanta Marie Thérèse Raphaëlle of Spain, the Dauphin's first wife. She died in childbirth in July 1746, just 18 months after her arrival from Spain. Her little daughter, Marie-Thérèse, died in 1748 at the age of two. Maria Josepha of Saxony, hastily summoned as a replacement. She was only 16 when she married the grieving Dauphin, and by all accounts was a very capable and confident young woman. She and her husband enjoyed a happy (and faithful) marriage. After a couple of false starts (imagine the pressure!) in 1750 she gave birth to her first child, a little girl named Marie Zephyrine, and the next year to a son, a long-awaited heir. That little boy died when he was 11, and his younger brother, the future Louis XVI, took his place in the line of succession. Her daughter Marie Zephyrine (what a lovely name!) died in 1755 at the age of 5. There is a charming anecdote in Luynes' diary about Zephyrine being jealous of her little baby brother when he received the Cordon Bleu sash, the mark of a member of the Order of the Holy Spirit (France's highest honor). She demanded to know why she couldn't have one too! The answer being, of course, because female. The Dauphine Josepha died in 1768, 3 years after the death of her husband. She had five children who survived to adulthood, and was the mother of three kings of France: Louis XVI, Louis XVIII and Charles X.
Jeanne's mother, a very beautiful woman who died in 1745 at the age of 45, from advanced breast cancer. This portrait is often attributed as her, but it's mislabeled (apparently because it was among the inventory of goods her son Abel left after his death). It can't be her: it dates from much later in the 18th century - again that big cap to hide the big hair (see the Princesse de Robecq) and she looks far older than 45. Jeanne's "uncle" and lover of her mother, and quite possibly her father. He was a wealthy tax farmer: in Ancien Regime France, you could purchase a territory from which you were responsible for collecting (farming) taxes. The Crown set a fixed amount, and if you succeeded in collecting more than that from your jurisdiction, you were allowed to keep the surplus. Needless to say, tax farmers were often very wealthy! Norman (as I call him in the book) came to Court with Jeanne and was appointed Director of the King's Buildings; the post later went to his nephew (son?) Abel. He died in 1751 at the age of 67. Jeanne's beloved little daughter, who died just before her tenth birthday. The portrait on the right is Jeanne and Alexandrine, enjoying some quiet family time in 1753, painted the year before her death. I think she's wearing a sort of padded helmet - notice the straps under her chin - that little children wore to protect them from falls and such. Jeanne's husband. Yikes. Once again (though the sharp ratty features are exactly how I pictured him) this is probably not him - this is a portrait of "Charles Le Normant de Coudray" - a relative, no doubt, but I could not find any connection between our Charles and de Coudray. Jeanne's brother Abel. Abel was a very important figure in her life, but he never really came alive for me, so he gets rather short shrift in The Rivals of Versailles. By all accounts an intelligent, practical man, he never cared much for titles and wealth, though was a passionate art collector. He married one of the putative bastards of Louis XV, a woman called Julie Marie Françoise Filleul, daughter of Irène du Buisson de Longpré, one of the fleeting mistresses of the king. Sadly, they didn't have any children. He was made Marquis de Vandières in 1745 and Marquis de Marigny in 1754. He's best known today as Abel de Marigny (which of course was punned as de Marinière - marinated). He succeeded his uncle as Director of the King's Buildings and served in that capacity until 1773, a total of 22 years. Frannie - Jeanne had a penchant for nicknames - was born in 1710 and died in 1788 (the perfect year for French aristocrats to die). Rarely mentioned in any of the biographies, the Luynes diaries attest that she was constantly with Pompadour during her first decade at Court. She married twice, first to the Marquis de Saint Aignan and secondly to the 4th Duc de Brancas, a titled duke (not all dukes were titled). She was 18 when she married him and he was 75! Not surprisingly, he died very quickly after the wedding. She was a lady-in-waiting to Mesdames (the King's daughters) from 1747 - 1766. Her step-daughter-in-law, also the Duchesse de Brancas (known as the Short, to distinguish her from the Tall, Frannie) was 30 years older and served in the Dauphine's household, as did her step-granddaughter-in-law, Diane, Duchesse de Lauraguais. Diane became Duchesse de Brancas in 1759 on the death of her father-in-law, the 5th Duke. Jeanne's ill-fated "friend". The first portrait by Vestier, on the left, comes up in a search of the internet, but it's not her. She was born in 1715, and the style of the portrait dates it to the 1790s - see the similarity with another portrait from Vestier, dated to 1792. The dark colors, the blue ribbon, the curly hair are all very similar and all very late 18th century. The pastel on the right, by Liotard, is probably her - she was uniformly declared an unattractive woman - though looks a little old. Elisabeth was born in 1715 (6 years older than Pompadour) and died in 1784. ​She was the lover of the Comte d'Argenson and shared his exile when she was banished from Court. The circumstances of her banishment was the major change I made in my book: click here to learn more about it. The Abbé de Bernis, one of Jeanne's confidantes and eventual minister, though he didn't last long in that role - in just a year he was awarded a Cardinalship (?) and effectively banished from Court. Bernis was a poet and also an "epigrammist" - someone who composed witty little sayings (not the silly little verses I have him spouting in the book). A good example of an epigram is from Oscar Wilde: "I can resist everything, except temptation." I couldn't find any of Bernis' epigrams though his poetry still exists. Bernis is described as "a gay butterfly flitting around the Marquise". He might have been gay in the modern sense, or he might not have been - apparently he was obsessed with Madame Infanta's (eldest daughter of Louis XV) breasts! Bernis reappears in my third book: he was friends with Mesdames and also shared part of their exile. Mirie in the book. 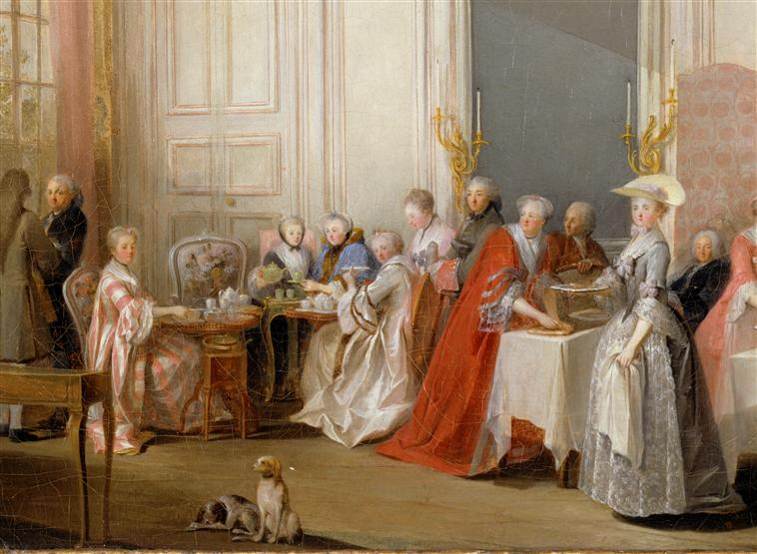 The painting on the left is entitled Thé à l’anglaise servi dans le salon des Quatre-Glaces au palais du Temple à Paris (1766) and is the only "image" of Mirie I could find on the internet. I've enlarged it to show Mirie, in black, pouring the green teapot to Madame de Vierville. They were drinking tea in the "English style" which meant with no servants! You'll see there are no servants in the room, and the lady in red doesn't look too happy about it. I love the third lady at the table, looking back at the painter as if to demand what on earth he is looking at. ​Note the teacups have no handles (visible at least). The lady in the grey at the extreme right with the hat is Septimanie, the Comtesse d'Egmont, the daughter of the duc de Richelieu. ​One of Louis' most capable ministers. He was very unattractive but was a total ladies' man and apparently had as much success in that arena as he had in politics. He remained loyal to Pompadour and Louis XV, but couldn't countenance the last mistress of Louis, the Comtesse du Barry, and as a result was banished from Court in 1770. It's a pity, because he was by all accounts a very capable man, and du Barry got on with pretty much everyone (yes, I'm biased!) I think there was a touch of sour grapes - he could never forgive du Barry that she was not of his choosing. He served his exile at Chanteloup then was allowed back to Paris in 1774 on the death of Louis XV, but unfortunately was not recalled to Court in a ministerial capacity (as he had hoped). He died in Paris in 1785, age 66. Beatrice de Gramont, the Duc de Choiseul's sister. She played a large role at Court during Jeanne's later years and after Jeanne's death. She was exiled along with her brother in 1770 and I assume followed him back to Paris (but not to Court) in 1774. She is sometimes confused with the Comtesse de Gramont, a sister-in-law, who served in the household of Marie Antoinette (and clashed with the Comtesse du Barry). Beatrice aspired to Louis' bed, and there is a funny (?) story that after Jeanne's death she raped him one night when he had had too much to drink. Despite (because of?) that she never succeeded in getting the hold over him that she and brother desired. Her marriage with the Duc de Gramont was one of convenience, to allow her to come to Court and share her brother's ascendance. She had many lovers, and died on the guillotine at the age of 64. She's often portrayed as a horrible woman, and I have continued that tradition, but I wonder if she was really that bad? She made the most of her situation and aspired to power and intrigue as many women did - it wasn't like they could use their brains and become lawyers or such! Marie Anne's sister. This portrait of Thais is from 1779 at the height (pun intended!) of the high hair fashions. She was middle aged in this picture, and is called de Mailly Nesle, because by this time her father had inherited the title of Marquis de Mailly Nesle from his cousin (father of the Mailly Nesle sisters). When she and her sister Marie Anne were younger, he was the Comte de Mailly-Rubempré and then the Comte de Mailly. He mother was in the service of the Dauphine and she was in the household of Madame Adelaide (she will feature in The Enemies of Versailles, which is told partially from Adelaide’s perspective). Her father inherited the title of Marquis de Mailly-Nesle, but his son (not featured in the book) had no heirs, and then the title went to another branch of the family, from which the present day Marquis de Mailly-Nesle is descended. The Comte de Montbarrey (later Prince) was an absolute prat. He left a memoire which probably had the goal of burnishing his legacy for posterity, but did exactly the opposite. My favorite part was when he blamed his infidelities on his wife: because she was so pious, she made him feel bad about myself, and so he was forced to take refuge with other women, who didn't make him feel so bad. For other characters, click on the links for Diane de Lauraguais and The Sisters of Versailles Secondary Characters page, which includes the Duc de Richelieu and the Comte de Maurepas.